Hi everyone! Today I have something really exciting for you! Ok, it’s probably more exciting for me than for you but I hope you enjoy reading it as much as I enjoy taking part in it! 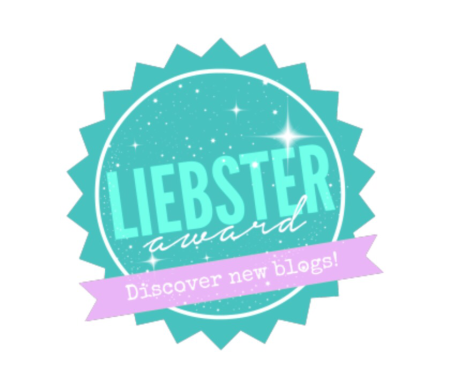 This week I was very kindly nominated to take part in the Liebster Award by Audrey at Forwards and Bookwords and I could not have been more delighted – thank you Audrey! Then, to my astonishment, I was nominated for a second time by Andy at Too Many Books Not Enough Shelves, so thank you very much Andy! I have honestly been amazed by how warmly I have been welcomed into the blogging community so I’d like to say a quick thank you to anyone who takes the time to read my blog, like my posts or leave lovely comments – it all makes me extremely happy! Anyway, on with the show! 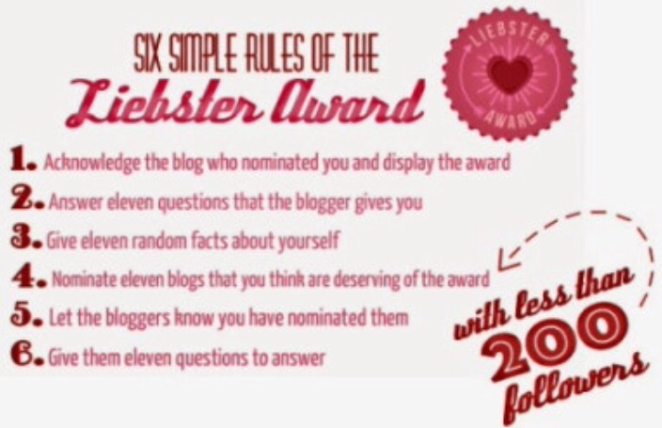 The Liebster Award is a way of recognising and promoting blogs that you love and think deserve recognition, particularly smaller/newer blogs such as mine! As I have been so kindly nominated twice I will be answering a total of 22 questions so I will try and keep my answers short and sweet! Would you rather never be able to read again or never be able to write again? This is a really tricky one but, shockingly, I’d rather never read again with the simple reason being that I write my own songs and the feeling of writing then singing one of your own songs is unparalleled, in my opinion. However, if I was never able to read again all of my songs would be VERY sad! Quidditch! I would love the opportunity to play Quidditch, I think I would play the position of chaser; maybe I’d even go pro like Ginny! A series that I love is the Secret Dreamworld of a Shopaholic series by Sophie Kinsella. Now I know that this is a widely loved and well-known series but I feel that in the blogging/booktube world it doesn’t get the attention that it deserves – I mean, come on; it’s hilarious! What is a book that you liked “before it was cool”? I honestly don’t think there is one! I’m usually pretty late to the party where books are concerned so . . .
How do you like to organise your bookshelves? My bookshelves are organised with my TBR first (in no particular order) then I have two postcards separating my TBR from my other books which are then organised in alphabetical order or author’s last name. Who, in your opinion, is the ultimate book villain? Hmm, I am torn between Lord Voldemort – poor child turned soulless mass murderer and Queen Levana of the Lunar Chronicles – evil queen who manipulates the minds of her subjects. Both are great villains in their own right! What book has a horrible cover but a great story? The Running Dream by Wendelin Van Draanen has a pretty awful/boring cover but the story inside is a stunning tale of an injured runner with an amazing goal. The writing in this book is so compelling and beautiful, if you haven’t read this book I would highly recommend it! What is a hyped book/series that you never see yourself reading? I will never read the Fifty Shades Of Grey trilogy. What is a book that you want to see turned into a movie? Ready Player One by Ernest Cline, this seriously needs to be a movie – like now! What book animal/creature would you like to have as a pet? A purple Pygmy Puff would be pretty cute, right? I would name it Dimple. What’s the least amount of pages it took you to decide not to finish a book? What book and why? I usually persevere with books all the way to the end but I read half of Mockingjay (from the Hunger Games Trilogy) and really didn’t like it so although I did finish it I only skim read the latter half. What book totally took you by surprise and how? To Kill A Mockingbird by Harper Lee took me totally by surprise. I read it with my class for school and at first I thought it was going to be a difficult read and not my cup of tea but it ended up being my favourite book of all time! I was totally won over by Harper Lee’s impeccable characters! If you could be transported into any world, what world would it be? I have to go with the cliché answer of the wizarding world of Harry Potter, is there anyone who wouldn’t want to go to school at Hogwarts, shop in Diagon Alley and buy sweets from Honeydukes? I don’t think so. What kind of character are you (hero/villain, main character/minor etc)? I feel that everyone’s life is a story, we are all living in our worlds and dictating when an old chapter ends and a new one begins. So, hopefully, I will be the hero of my own story. If you were ever able to meet your favourite author, who would it be and what would you say to them? One of my favourite author’s is Sophie Kinsella so if I had the opportunity to meet her I hope that I would be over afternoon tea and I would ask her to recommend books to be, chat about Becky Bloomwood and hopefully get the scoop on her latest writing project! Who’s your favourite minor character? Why? One of my favourite minor characters is Iko from the Lunar Chronicles simply because she is so adorable in the way that she so desperately wants to be a human and I love when she fangirls over the boys in the series, especially Prince Kai. What stand-alone book do you feel deserves a sequel? For this one I’d have to go with My Life Next Door by Huntley Fitzpatrick. I know that her other books are kind of companion novels, as they’re set in the same town so we get to see/hear snippets of Samantha and Jase’s relationship but I will always have the need for more, I NEED DETAILS!! I will read pretty much anywhere; in fact 99% of the time there is a book in my bag, no matter where I am going! But the majority of the time I read in/on my bed – it’s just so comfortable! I will say though; one day I hope to have a really cute/comfy reading nook or a window seat as my designated reading spot. How are your bookshelves organised? Do you ever buy cover reprints? This is not something that I have done in the past but it is definitely be something that I do in the future starting with the Harry Potter series! What fictional character do you wish actually existed? Ok, so my story isn’t funny but I think it may be interesting? Basically, at one of my school fairs my mum entered me into the raffle without my knowledge so when the names of the winners were being called out at assembly I wasn’t really paying attention. Then my name was called so I had to quickly get up and go to the front to collect my prize and I had won the first four Harry Potter books (all that were out at the time) and that’s how I came to read and fall in love with the Harry Potter series, a stroke of luck and a raffle ticket that I didn’t even know I had! My three favourite things are books, music and cake! What is the reasoning/meaning behind your blog name? Would you rather; everyone read/knew about your favourite book or no one but you knew about/could read your favourite book? Who most encouraged you to start reading? What is your favourite era/century from the past? And why? So, you have reached the end of this mammoth post, well done! Thanks again to Audrey and Andy for nominating me and I can’t wait to read the posts of those I have nominated! Happy to follow your blog, I look forward to your posts if they’re even half as good as this one. Thank you! I just read your post about Jaffa Cakes which I thought was amazing, you have done the world a great service, haha! Ah, you liked that? I have to admit the idea came from a fellow blogger (robynchristi). We both wrote Jaffa cake posts in very different ways. I’m glad you liked it and I appreciate you taking time to say so. I’m trying to write more and I’m always looking for good writers to pick up tips from. If you keep and eye on universeofpossibility you should see my work pop up soon. Ah, I will have to go and read their post too! I will definitely keep an eye out for more of your work! Not crap at all, positivity is the key! It is. Not like my latest cramped office post. But I’m trying to be funny there. Thank you for the super fun questions, I really enjoyed answering them! Oh yes, shopping at universal studios was an amazing experience, according to my family it took me an hour to decide what to buy but it only felt like 5 minutes to me!